Say that one three times fast. Update: Developer Fatshark has detailed a huge upcoming patch for Vermintide over on its forums. There's also an open beta for the patch and Karak Azgaraz; you can sign up for that here. 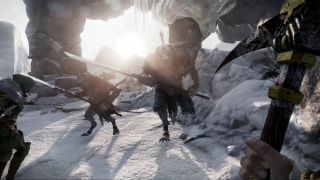 Warhammer: End Times—Vermintide is encroaching on Skyrim's wintry territory with the upcoming Karak Azgaraz, a recently announced bit of DLC that will take your rat-slaying hunters to chillier climes. Specifically, you're heading to the Dwarfen fortress of the same name, for it too has succumbed to the Skaven horde. There are three new levels included in Karak Azgaraz. "Battle the Skaven in the ancient halls of the Dwarfen Khazid Kro, made of cold stone and old technology. Explore the mountains in search of The Cursed Rune. Finally, make your way to the top of the mountain to light the first beacon and trigger the Chain of Fire." There are two new weapons up for grabs as well: the Dwarf Ranger's Warpick, plus the Falchion, which can be used by the game's Witch Hunter character. You want a release date, of course, but there currently isn't one, so for now we'll just have to save the dwarfs in our imaginations. There's a trailer on Steam, but not on YouTube, so I can't embed it. It's basically Moria, but with rats.